Halva. When you just gotta halva something sweet. Halva you ever had halva? If you just read that sentence with an Italian accent, you halva (geographically speaking) missed the mark, but it’s fun to do. She didn’t get my pun, as she had never heard of halva before. After all, it’s not like we can just run down to Abilene’s Jewish, Persian or Greek market (or restaurant for that matter) and just pick some up. The versions we’ve had most are Tahini-based, sweetened with honey and loaded with nuts such as pistachios. 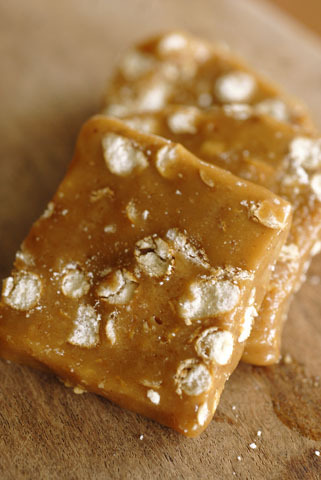 And, we’ve had textures that range from an extremely dense, chewy taffy to a crumbly, dry and sweet nut butter. Halva is a dessert that takes on a couple of different forms (nut butter based or flour/vegetable based) and any number of flavor combinations. Confectioners who sell it – most commonly in the Middle East, Asia, Africa and parts of Europe – add all kinds of extracts and ingredients to tantalize their customers’ palates. And, it’s ancient. There are indications that forms of it halva existed since about 3,000 B.C.E., although the first written recipes for it show up in the early 13th Century in the Kitab al-Tabikh (Arabic cookbook: The Book of Dishes). 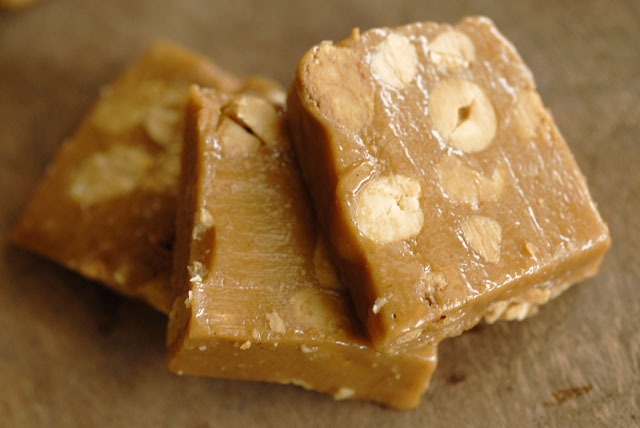 The Yiddish word “halva” is derived from the Urdu word “halwa,” which means “desserts” or “sweet.” The recipe we halva for you today is similar to a Jewish version that we have eaten, meaning that it is of the nut butter variety (nut butter and honey cooked until it is a candy). The other branch of the halva family tree is flour- or vegetable-based and usually involves semolina flour, butter and sugar that is cooked into what folks in our part of the world (The South) identify as a roux that is eventually formed into a cake/pudding. For your edification (eatification? ), our recipe today will be an interpretation of a nut-based halva, utilizing honey and peanuts, which are much more abundant and available in our part of the world than sesame butter (Tahini). Not to mention, that peanut butter will likely serve as a better gateway drug to the “real thing” for our audience. If you like peanut butter and honey, you are going to want to halva some of our halva. Our peanut butter, honey and pretzel halva recipe follows all of the Halva puns that Julie (the woman to whom I am married) edited out of the main body of this post but that I sneaked in here at the end. Perhaps we have been misinterpreting/mishearing some of these. What did they really mean? Peanut butter and honey halva with whole roasted peanuts. 2. Heat peanut butter to 120 degrees Fahrenheit. 3. Add peanut butter to honey and stir until incorporated. 4. We like to pour our mixture into a Vitamix and run on “high” for a few seconds until the mixture is very smooth. (Warning: If you have a low-end blender, be careful. You will burn up its motor in no time because the mixture is so thick). Peanut butter and honey halva with pretzels. 6. Pour into an oiled loaf pan or Pyrex dish and allow to come to room temperature before wrapping in plastic and placing in your refrigerator. 7. Let it sit 24-36 hours in the refrigerator so that the honey is well-crystallized. ***Note: Halva will remain good for a few months in the fridge, provided it is wrapped and in an airtight container so that it doesn’t start to take on the funk your refrigerator has developed from not cleaning it often enough. And, you don’t necessarily have to refrigerate it if you are going to eat it within a week or so and you don’t live somewhere like Texas where the temperatures approach those of the sun, melting it and leaving a puddle on your kitchen counter (lesson learned). This entry was posted in Culinary, Food and tagged candy, dessert, halva, jewish, peanuts, persian, Recipes, sweets on July 3, 2015 by Out of Abilene. Es un tipo de pastel de tradición oriental hecho con una masa que se obtiene de moler semillas de sésamo tostadas hasta conseguir una pasta muy fina llamada tahini que se mezcla con agua o leche y azúcar granulada.